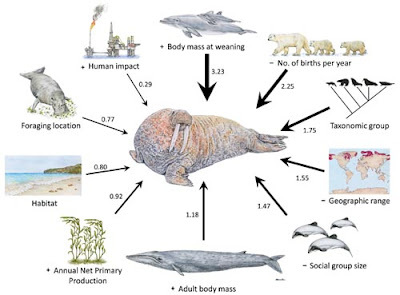 New research from an international team of researchers indicates that humans pose a higher risk of extinction for marine mammals. Now, for many ocean conservation advocates I can hear the collective "Duuuuuh" right now, complete with eyes rolling round in their sockets. But wait. 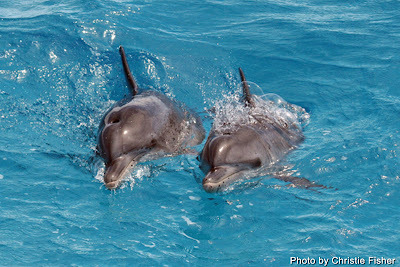 This particular study, "Drivers and Hotspots of Extinction Risk in Marine Mammals" published in the journal Proceedings of the National Academy of Sciences USA, has the potential for catching the attention of international ocean management organizations because of the methodologies used by the researchers to draw their conclusions. There are computer models that have been successfully used to determine the status of terrestrial mammals. These predictive models incorporate a variety of factors including habitat, body mass, rate of reproduction, social group size, and more. Each factor is weighted based on the particular species. All have an impact on how well a particular species survives and what their future may have in store when certain factors change, such as pollution, loss of habitat, or climate change. Marine mammals currently include 128 different species from whales and dolphins to seals and sea lions to manatees and dugongs. And right know the status of nearly 40 percent of them are unknown due to a lack of data. Even with that limitation, the IUCN Red List considers 25% as endangered. However, this new study's predictive model pushes that figure closer to 37 percent. A press release issued by the University of New Mexico reported, "Using their pre­dic­tive model, the team also gen­er­ated new maps of species at risk. They illus­trate that at-risk species mostly occur in coastal regions and in pro­duc­tive areas of the open ocean, which are also areas sub­ject to high lev­els of human impact. The mod­els iden­ti­fied 13 global hotspots where high num­bers of at-risk species occur, and show how they over­lap with lead­ing human impacts on the world’s oceans (fish­ing, ship­ping and pol­lu­tion, and cli­mate change) and Marine Pro­tected Areas." “We found that three-quarters of marine mam­mal species expe­ri­ence high lev­els of human impact in their envi­ron­ment, and these include the cumu­la­tive effects of numer­ous fac­tors, includ­ing fish­ing, ship­ping, pol­lu­tion, sea sur­face tem­per­a­ture change, ocean acid­i­fi­ca­tion, inva­sive species, oil rigs, and human pop­u­la­tion den­sity,” said Dr. Ali­son Boyer, another researcher from the Uni­ver­sity of Tennessee involved in the study. This new research adds to a growing body of work that supports the concept of Marine Protected Areas and other recognized marine parks or sanctuaries, while also recognizing the need for more international management policies. There is much to be learned about marine mammals, more than most people think. However, studies like this make the case that we cannot just sit on our hands and wait for data on each and every species to arrive. 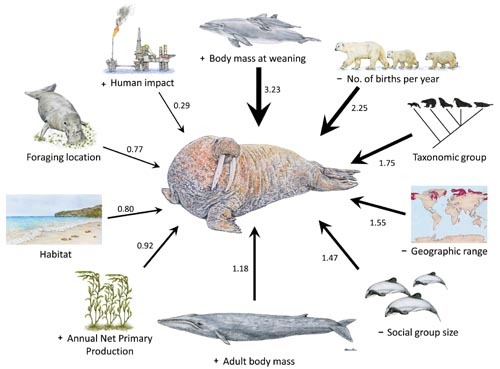 Predictive models that have been shown to be of value on land can also show that time is running out for marine mammals as well if decision makers choose to hesitate and strong preventative measures are not taken. Good study report, marine life's important is beyond any word, they are maintaining balance of marine environment, very useful for the food most famous in the food market.